The Kent Connects Developing Solutions Camp on Friday provided inspiration not just from the main activity of developers working on applications for open data, but from the side conversations that this sort of relatively unstructured event encourages. I’ve added additional videos to my original post, and you can see them in a playlist here. I’ve already posted one conversation here with Tom Phillips, about the need for big organisations to practice open conversations internally if they wish to use social media externally. Tom has worked extensively in local government, and with community and voluntary organisations. We also talked about different models of networks, and revisited an earlier post here on networks. I posted what follows first on my personal blog. Part of the work I’m doing with Big Lottery Fund (BIG) on People Powered Change, with John Popham and Drew Mackie, is exploring how BIG can be more than a funder, and help groups that they fund to they share ideas and experience. As part of the discussion, I offered a diagram suggesting a change from hierarchical structures to more of a peer-to-peer mesh: Moving from join us, join in, to join up yourselves. The join-up part of the diagram shows a network that is usually seen as a connected set of people. But Tom made the point that the nodes could just as well be activities, including sociable events. That certain chimes in with my experience, where reporting events has been one of the best ways of doing the join-up bit of social reporting. Here’s some earlier reflections. However, to make the events useful for joining up outside the room, I think that the social reporter needs to do a bit more than just shoot video, blog or tweet. It is important to look for stories and ideas that might be specially relevant for people who are not there, and make sure they get both a link and an introduction. It means organising events that allow space for the sort of conversations that I had with Tom here – and also in this post about sociable organisations. …….that is putting yourself in the place and way of likely useful links to take forward projects etc. That certainly happened to me at a recent event in Manchester, when I met community mobilisers Corrina and Andy and their iPhone app. Today I have been able to make the link between that conversation, and the developments in Kent, strengthening idea of a social app store. So to build networks, hold events that can connect both ideas and people. An event in Gravesend today showed me how a mix of open data from councils, the skills of software developers and smartphone apps could lead to a social app store that residents could use to benefit themselves and their community. The Developing Solutions camp, organised by Kent Connects and hosted by Gravesham Council, has brought together technology designers and other working on a range of ideas for using tech for neighbourhood benefit. 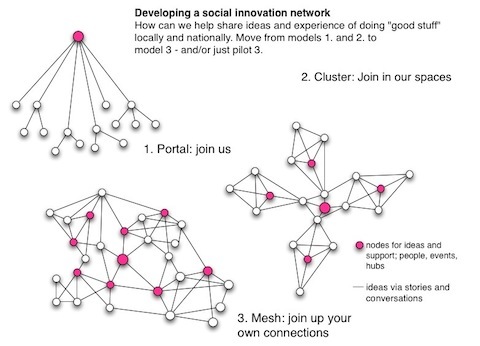 You can see the ideas here, originally pitched on the Dotgovlabs innovation hub. The ideas include community vehicle booking, mapping council land and empty shops, and an exploration learning game. The task of those present is to develop a prototype that could win them a prize of £1000 at the end of the day. In recent years there have been quite a few of this type of event around the country, and it sounds as if we may be getting to the point where there are enough viable solutions around to make it worth bringing them together. This might be the basis for a social app store on the lines that I, John Popham and others have been promoting. The app store idea started here, and chimes with the idea that the future of online sharing is mobile, applified and personal. Today Darren Everden, Gravesham IT service manager, and Antony Parker, Kent Connects business implementation manager, explained how the release of data held by council can create value and lead to community benefits. Developers are able to package the data into smartphone apps that solve problems and provide services to citizens. The apps cost only a few pounds – but if enough are sold, that creates a viable market and leads to community benefits without major public spending. At the moment the apps are being developed in different places. While the data may be specific to different localities, the underlying technology to make it accessible to people could be common. So there could be an app store with common solutions tailored to local needs. As I understand, the problem is that data is currently held in different formats, and it needs some policy directive from government to push public agencies to collaborate. If that were done, there could be some major benefits. Kent Connects Partners have a track record of innovative collaboration between citizens and councils, and last year ran a Transformed by You event that I reported here. Kent Connects is providing the partnership for local collaborations, so I hope the Cabinet Office might see this as an inspiration for a route to achieve big benefits from minimal spending. I’ve now uploaded other videos, including an interview with Roger Gough, Kent Council Council Cabinet member responsible for technology, and interviews with the winners. If you have problems viewing them here, the individual videos are all available in this playlist.